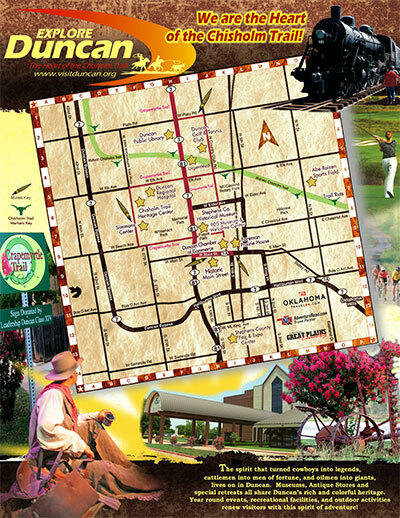 Originally a small trading post at the intersection of the old Chisholm Trail cattle road and the military passage between Fort Arbuckle and Fort Sill, Duncan has seen and participated in every phase of Oklahoma’s exciting history. From the earliest explorers and Native American settlement, to the historic cattle drives, US Cavalry patrols, the lands runs, oil industry, and modern light industry, Duncan’s rich heritage includes pages from some of the most exciting times in American history. Everything started with William Duncan, a Scotsman who brought his wife, parents, and other relatives to this area after learning that the Rock Island Railroad was extending its lines from Kansas to Texas. He built a store to serve the passengers that would be coming through, as did other settlers. By the time the first train arrived on June 27, 1892, Duncan (named after its founder) had become a new town on the western outskirts of the growing nation. The early years were very difficult for the town and its inhabitants. Despite a devastating tornado that nearly destroyed every store and building on Main Street and four fires in 1901 that also dealt a severe blow to the downtown area, the residents forged on, and Duncan continued to grow, with new businesses appearing weekly. A celebration called Founder’s Day is still held every year during the last week in June to celebrate the town’s birthday and the adventurous spirits of those who have made Duncan what it is today. One individual that left an incredible legacy here in Duncan was Erle P. Halliburton. He was a young entrepreneur who changed the industry by perfecting a new method of cementing wells, making oil production much easier. He established the New Method Oil Well Cementing Company in 1919, and his innovation soon became widely used. By Erle Halliburton’s death in 1957, the company, now Halliburton, had 201 offices in 22 states and 20 foreign countries. It continues to thrive today. Mr. Halliburton not only provided jobs for many people here in Duncan, he gave generously to many different causes in town and elsewhere. Duncan’s past is full of stories of adventure and innovation, and our future will be no different. With great companies like Halliburton, Family Dollar, and Valco Manufacturing leading the charge, Duncan is making good on keeping our town a leader into the 21st century. Visit the Duncan Chamber of Commerce for more information. As you might be able to tell, we love our town. We think you will too. We are looking forward to your visit to Duncan.